To put it simply, I really enjoyed Rules for 50/50 Chances. Rose is one of the realest teen narrators I've read in a while, and not just because of her vernacular. It is actually quite impressive how easily McGovern manages the many things Rose is dealing with: her mother's Huntington's disease and what it means for her, a budding romance with artistic Chad, uncertainty about what her future as a university student is going to look like. She makes all these things fit perfectly into the puzzle of Rose's story, never missing a beat when it comes to making sure all these aspects are developed properly. While there were times I found her so frustrating, it is testament to how well-written her character is that I also understood where she was coming from. It's even nicer to know that Rose is not the only memorable character. There's Chad, the boy who makes her laugh and understands her feelings about her mother's condition. There's Lena, her supportive, vivacious best friend. There's her grandmother, who came over from England to help out around the house; her father, who struggles to do his best in light of the situation; her mother, torn between who she used to be and who she's becoming at the hands of her disease. McGovern really takes the time to introduce these characters, and it certainly pays off! But, more than anything, it's the raw authenticity that makes Rules for 50/50 Chances stand out. Yes, I loved the adorable romance that develops. Yes, the friendship was something I approved of. Yes, the depiction of Huntington's Disease is detailed and educational. Yes, I enjoyed the mentions of art, and trains, and ballet as a big part of these character's lives. But it is the way McGovern didn't hesitate to peel back the layers and show us the truth of what's underneath everything that really appealed to me. Rose's narration - how she feels, what she does, what she says - is laid bare for the reader, whether it happens to be good or bad, right or wrong. This is true from start to finish, and I really love that we're not given rose-colored glasses to view this situation. The disease is a tragedy, and the way that it is affecting everyone involved is terrible. There are good things, yes, but there are also bad things, and the fact that both are included in this story just made it even better. 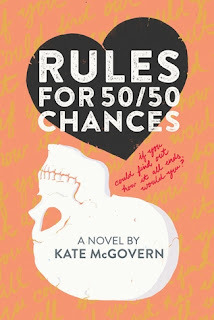 If you're looking for something a little bit different in the contemporary YA genre, you should pick up Rules for 50/50 Chances. It's sad and frustrating; it's heart-warming and cute. And, most of all, it's one of the realest contemporaries I've had the fortune to read. Are you a train person or a plane person? Am I allowed to cheat and say that I'm both? I love traveling, and these are actually my two favorite ways to get to the places I want to go. I've ridden on many more planes versus trains, but I'd have to say that I'm pretty darn sure I'm a train girl. Even though it takes up more time to take trains, I love it. I love being able to sit by a window and watch the scenery going by, changing as we move along the track. I love the amount of space I have to stretch, and the freedom to walk around when I'm tired of sitting. I've also just felt more comfortable sitting on trains for long periods of time, feeling the easy, slight sway of the wheels carrying us forward. Plus, more transit time means more reading time! All in all, I don't mind a long journey; sometimes, it's just fun to take your time savoring the experience of getting to a new place. Oh wow, I definitely need to give this a read! I'm all for realistic teen narrators and authentic stories and adorable romance and everything you mentioned about this book. Looking forward to checking this out! Thanks for the fabulous recommendation, Alexa! I will be reading this one very soon! It seems to be getting many positive reviews! I agree! This book did feel realistic, while at the same time it felt really unique. The Huntington's Disease aspect is only something I've seen in a book once before (and it was pubbed originally back in the 90s). Glad you enjoyed this one too! I've been curious about this one! Glad to hear you are a fan and that the teen narrator was realistic. I hope to find this one at my library soon.